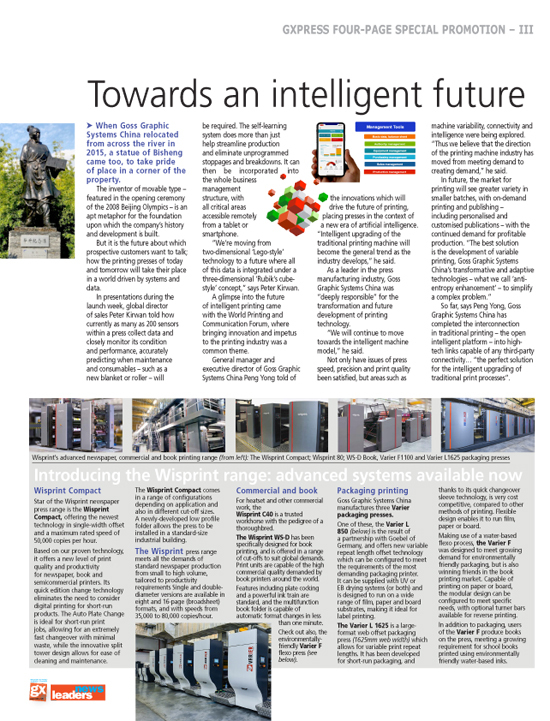 A new star launched into the web-offset printing firmament last month with the global launch of the Wisprint brand. A trade event in Shanghai greeted the newcomer, which builds on decades of experience and centuries of printing tradition. More than 1000 guests attended open days at the new Goss Graphic Systems China factory, concurrently with the All In Print exhibition in the city, and following the World Artificial Intelligence Conference. And learning systems and artificial intelligence were very much to the forefront when general manager and executive director of Goss Graphic Systems China Peng Yong spoke of a future in which smart printing machines were linked three-dimensionally in an intelligent network. "Innovation has been the development concept of Goss Graphic Systems China for a long time," he told guests. "Innovative technology in our integrated printing systems will drive development and ultimately realise the goal of intelligent printing." 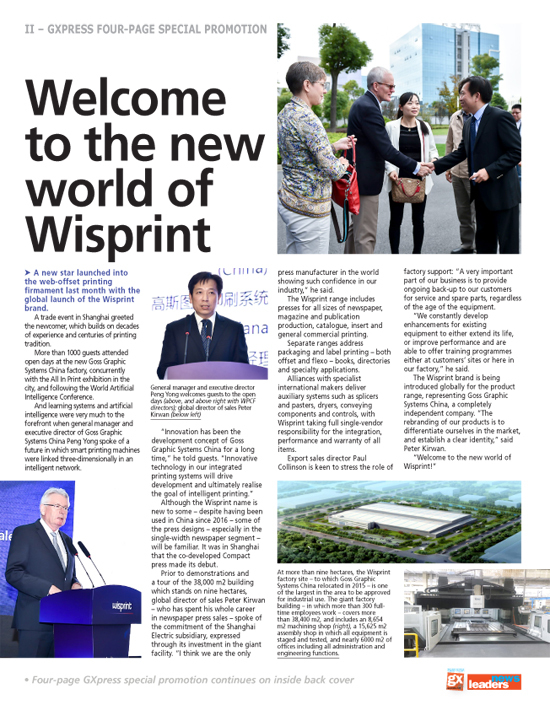 Although the Wisprint name is new to some - despite having been used in China since 2016 - some of the press designs - especially in the single-width newspaper segment - will be familiar. It was in Shanghai that the co-developed Compact press made its debut. Prior to demonstrations and a tour of the 38,000 m2 building which stands on nine hectares, global director of sales Peter Kirwan - who has spent his whole career in newspaper press sales - spoke of the commitment of the Shanghai Electric subsidiary, expressed through its investment in the giant facility. "I think we are the only press manufacturer in the world showing such confidence in our industry," he said. The Wisprint range includes presses for all sizes of newspaper, magazine and publication production, catalogue, insert and general commercial printing. Separate ranges address packaging and label printing - both offset and flexo - books, directories and specialty applications. Alliances with specialist international makers deliver auxiliary systems such as splicers and pasters, dryers, conveying components and controls, with Wisprint taking full single-vendor responsibility for the integration, performance and warranty of all items. Export sales director Paul Collinson is keen to stress the role of factory support: "A very important part of our business is to provide ongoing back-up to our customers for service and spare parts, regardless of the age of the equipment. "We constantly develop enhancements for existing equipment to either extend its life, or improve performance and are able to offer training programmes either at customers' sites or here in our factory," he said. 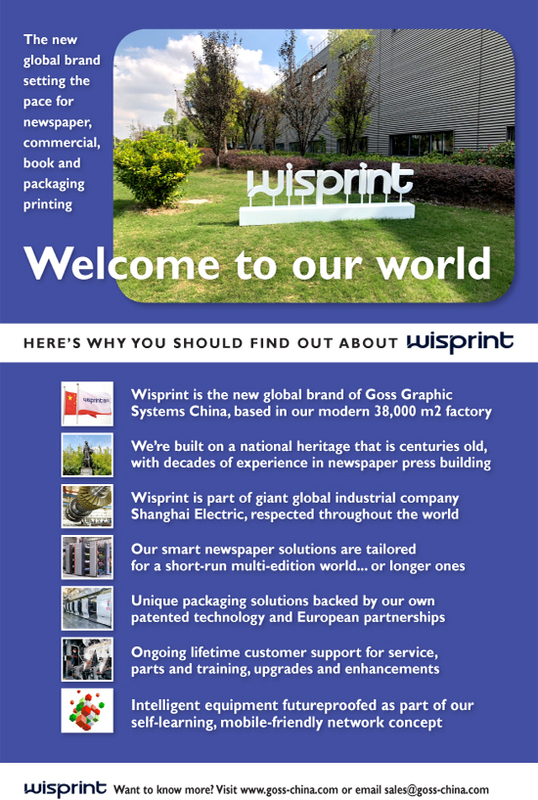 The Wisprint brand is being introduced globally for the product range, representing Goss Graphic Systems China, a completely independent company. "The rebranding of our products is to differentiate ourselves in the market, and establish a clear identity," said Peter Kirwan. "Welcome to the new world of Wisprint!" At more than nine hectares, the Wisprint factory site - to which Goss Graphic Systems China relocated in 2015 - is one of the largest in the area to be approved for industrial use. The giant factory building - in which more than 300 full-time employees work - covers more than 38,400 m2, and includes an 8,654 m2 machining shop, a 15,625 m2 assembly shop in which all equipment is staged and tested, and nearly 6000 m2 of offices including all administration and engineering functions. When Goss Graphic Systems China relocated from across the river in 2015, a statue of Bisheng came too, to take pride of place in a corner of the property. The inventor of movable type - featured in the opening ceremony of the 2008 Beijing Olympics - is an apt metaphor for the foundation upon which the company's history and development is built. But it is the future about which prospective customers want to talk; how the printing presses of today and tomorrow will take their place in a world driven by systems and data. In presentations during the launch week, global director of sales Peter Kirwan told how currently as many as 200 sensors within a press collect data and closely monitor its condition and performance, accurately predicting when maintenance and consumables - such as a new blanket or roller - will be required. The self-learning system does more than just help streamline production and eliminate unprogrammed stoppages and breakdowns. It can then be incorporated into the whole business management structure, with all critical areas accessible remotely from a tablet or smartphone. "We're moving from two-dimensional 'Lego-style' technology to a future where all of this data is integrated under a three-dimensional 'Rubik's cube-style' concept," says Peter Kirwan. A glimpse into the future of intelligent printing came with the World Printing and Communication Forum, where bringing innovation and impetus to the printing industry was a common theme. 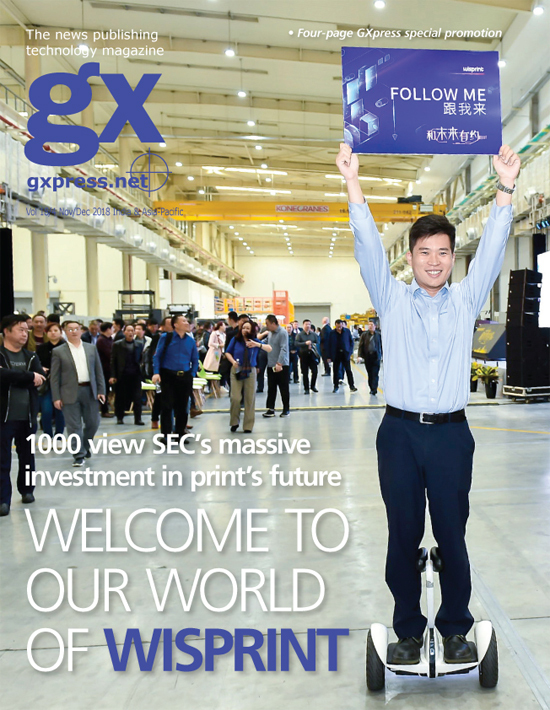 General manager and executive director of Goss Graphic Systems China Peng Yong told of the innovations which will drive the future of printing, placing presses in the context of a new era of artificial intelligence. "Intelligent upgrading of the traditional printing machine will become the general trend as the industry develops," he said. As a leader in the press manufacturing industry, Goss Graphic Systems China was "deeply responsible" for the transformation and future development of printing technology. "We will continue to move towards the intelligent machine model," he said. Not only have issues of press speed, precision and print quality been satisfied, but areas such as machine variability, connectivity and intelligence were being explored. "Thus we believe that the direction of the printing machine industry has moved from meeting demand to creating demand," he said. In future, the market for printing will see greater variety in smaller batches, with on-demand printing and publishing - including personalised and customised publications - with the continued demand for profitable production. "The best solution is the development of variable printing, Goss Graphic Systems China's transformative and adaptive technologies - what we call 'anti-entropy enhancement' - to simplify a complex problem." So far, says Peng Yong, Goss Graphic Systems China has completed the interconnection in traditional printing - the open intelligent platform - into high-tech links capable of any third-party connectivity... "the perfect solution for the intelligent upgrading of traditional print processes". Star of the Wisprint newspaper press range is the Wisprint Compact, offering the newest technology in single-width offset and a maximum rated speed of 50,000 copies per hour. Based on our proven technology, it offers a new level of print quality and productivity for newspaper, book and semicommercial printers. Its quick edition change technology eliminates the need to consider digital printing for short-run products. The Auto Plate Change is ideal for short-run print jobs, allowing for an extremely fast changeover with minimal waste, while the innovative split tower design allows for ease of cleaning and maintenance. The Wisprint Compact comes in a range of configurations depending on application and also in different cut-off sizes. A newly-developed low profile folder allows the press to be installed in a standard-size industrial building. The Wisprint press range meets all the demands of standard newspaper production from small to high volume, tailored to productivity requirements Single and double-diameter versions are available in eight and 16-page (broadsheet) formats, and with speeds from 35,000 to 80,000 copies/hour. For heatset and other commercial work, the Wisprint C40 is a trusted workhorse with the pedigree of a thoroughbred. The Wisprint WS-D has been specifically designed for book printing, and is offered in a range of cut-offs to suit global demands. Print units are capable of the high commercial quality demanded by book printers around the world. Features including plate cocking and a powerful ink train are standard, and the multifunction book folder is capable of automatic format changes in less than one minute. Check out also, the environmentally-friendly Varier F flexo press. Goss Graphic Systems China manufactures three Varier packaging presses. One of these, the Varier L 850 is the result of a partnership with Goebel of Germany, and offers new variable repeat length offset technology which can be configured to meet the requirements of the most demanding packaging printer. It can be supplied with UV or EB drying systems (or both) and is designed to run on a wide range of film, paper and board substrates, making it ideal for label printing. The Varier L 1625 is a large-format web offset packaging press (1625mm web width) which allows for variable print repeat lengths. It has been developed for short-run packaging, and thanks to its quick changeover sleeve technology, is very cost competitive, compared to other methods of printing. Flexible design enables it to run film, paper or board. Making use of a water-based flexo process, the Varier F was designed to meet growing demand for environmentally friendly packaging, but is also winning friends in the book printing market. Capable of printing on paper or board, the modular design can be configured to meet specific needs, with optional turner bars available for reverse printing. In addition to packaging, users of the Varier F produce books on the press, meeting a growing requirement for school books printed using environmentally friendly water-based inks.